by Eddie Milton Garey Jr. In Illinois, federal judges have allowed at least two lawsuits to proceed against correctional officials for using full body scanners to reveal the anatomy of both prisoners and visitors without removing their clothing. This is the very same device that airports are seeking to implement on some inbound flights to the United States. The cases of Young v. County of Cook, 2009 U.S. Dist. Lexis 64404(N.D. 111. ), and Zboralshi v. Monohan, 616 Supp.2d 792, 798 (2006, N.D. Ill), explain, “A Rapiscan is a machine that uses ‘back-scatter’ x-ray technology to conduct a body scan.” There is no significant difference between using Rapiscan and computer tomography (CT scan) whole body scanning. Despite the clearance of some CT scanners (Rapiscan), the FDA’s website shows that no data has ever been presented to the agency as to the safety of these devices and states that it has never approved these devices as being safe because “some Food and Drug Administration officials were worried that full-body CT screening scans (Rapiscans) ‘may be exposing thousands of Americans to unnecessary and potentially dangerous radiation’ and that CT scans of the chest delivered 100 times the radiation of a conventional chest x-ray … between .2 to 2 rads of radiation during a single scan.” See, e.g., Virtual Physical Ctr-Rockville, LLC v. Philips Med. Sys., 478 F.Supp.2d 840, 842-43(D. Md. 2007) and “FDA Raises Body Safety Issue” by Marlene Cimons in the Los Angeles Times, June 5, 2001. 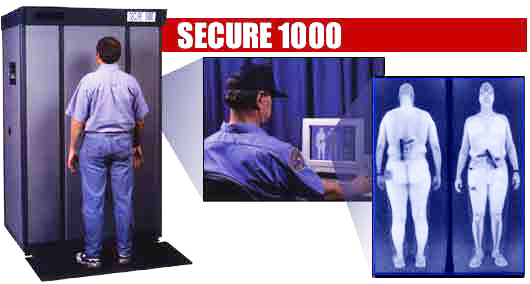 The Federal Bureau of Prisons officials have been forcing inmates at USP Big Sandy to submit to random computerized tomographic whole body radioactive scanners. If they refuse to submit to these radiation experiments, prison officials are charging them with disobeying a direct order and subjecting them to a wide range of sanctions, including but not limited to loss of good time credits, resulting in an extended time in prison, even if they agree to be subjected to an ordinary visual strip search as a reasonable alternative to radiation exposure from the whole body scanner. These images are saved and viewed by male and female staff and available online to certain civilian populations. Regulations at 28 CFR §§ 512.11 and 512.12 prohibit the government from using inmates for this type of experimentation and require them to give both the inmates and the public notice of their intent to use inmates as test subjects as well as all of the possible effects related to being subjected to any such experimentation – and then only on a voluntary basis. See also Administrative Procedure Act, 5 U.S.C. § 551(4) and 5 U.S.C. § 553(b)-(d). Federal regulations also prohibit the use of x-ray, MRI or similar devices on inmates for any reason other than legitimate medical purposes or only when there exists reasonable suspicion that the inmate has recently secreted contraband – and then only by a licensed practitioner in the manner set out in 28 CFR §§ 552.13(b)(1) and 541.48. The government has been forcing prisoners, the majority of whom are Blacks and Hispanics, to be subject of these types of inhumane experiments for years. They recall the Tuskegee experiments, where 400 Black men were allowed to suffer with syphilis for 40 years so that doctors could study the disease. Also, Dr. Albert Kilgman, at Holmesburg Prison near Philadelphia, under the direction of major pharmaceutical companies like Merck and Dupont, exposed Black prisoners to herpes, gonorrhea, malaria, dysentery and even athlete’s foot from the 1950s to the 1970s. In 1952 over 300 Black inmates at an Ohio state prison were injected with live cancer cells so that doctors at the Sloan-Kettering Institute could study the effects. In these cases the research subjects’ rights were violated because either they were not told that they were participating in an experiment or the government knew the experiments had no therapeutic value, or both. Other cases include Heinrich v. Sthemet, 62 F.Supp.2d 282(D.Mass. 1999) (government utilized false pretenses to lure plaintiffs into participating in radiation experiments which the government knew had no therapeutic value); Stadt v. Univ. of Rochester, 921 F.Supp. 1023 (W.D.N.Y. 1996) (plaintiff, who thought she was receiving medical treatment for scleroderma, was injected with plutonium without her knowledge or consent as part of a U.S. Army study); In re Cincinnati Radiation Litig., 874 F.Supp. 796 (S.D. Ohio 1995) (plaintiffs were not informed that the radiation they were receiving from the Department of Defense was part of a military experiment rather than treatment of their cancer). In Allen v. United States, 588 F.Supp. 247, 399 (D. Ut. 1984), the court held that it is becoming established that shortening of life span is a general effect of whole body exposure to ionizing radiation. Experiments have also shown a similar reduction may be caused by irradiation of substantial portions of the body from ingestion of radioactive materials. In all of those cases, both the state and federal government had told the subjects that they experimented on that the radiation levels were harmless – only for the victims to learn later that they were in fact not harmless, but deadly! It has also been reported that these whole body Rapiscan scanners have been malfunctioning. They have caused electrical shocks as in the case of Carrie Milton v. Rapiscan, 2005 U.S. Dist. Lexis 11574(E.D. La.). An airport security screener was severely shocked and suffered permanent injury to her hand operating one of these Rapiscans. Independent tests on Rapiscan devices have also shown that the EEPROM chips, which are used to calibrate the radiation levels of the whole body scanners, have repeatedly malfunctioned, resulting in greater radiation exposure than Rapiscan reports on its own websites. Some prisoners have experienced blurriness of vision, headaches and groin pains after being subjected to these whole body radiation scans. Many of these prisoners have been Rapiscanned up to three times in a single day, even though they never left the institution or had any contact with anyone outside the institution. Other experiments include testing psychotropic narcotics on inmates who have not been prescribed them just to see their effects, such as in the recent case of Walker v. Hastings, 2009 U.S. Dist. Lexis 80924, Case No. 09-CV-074-ART(E.D. KY). Walker was diagnosed with H Pylori, a bacterium that can infect one’s stomach or intestines, but was given Zyprexa, a psychotropic narcotic on at least nine different occasions by a prison pharmacist at USP Big Sandy seeking to test the effects of the medications for pharmaceutical companies. If this is a legitimate security concern and not for the mere use of inmates as test subjects for private interests of companies like Rapiscan Corp., then ask the Obama administration, Eric Holder and Department of Justice officials why are they threatening inmates and charging them with disciplinary infractions for disobeying unlawful orders to submit to these radiation experiments, even when they are willing to submit to an ordinary strip search? The inmates have only refused to be exposed to harmful amounts of radiation and not to be the subject of a human radiation experiment, but they never disobeyed any lawful orders. Yet on March 1, the warden at USP Big Sandy imposed a lockdown that is expected to last at least two months. The lockdown is clearly in retaliation against Black prisoners for exercising their First Amendment rights to petition the government for redress of grievances. Since this prison has been open, no lockdown has lasted more than 21 days – not even when there were repeated back-to-back murders. But when all the inmates have found common ground for unifying lawfully, the federal white overseers have deemed this to be a threat to the order, security and discipline of the institution. This warden finds it a serious security threat when all of the different factions of inmates decide not to focus on killing one another but on coming together in peaceful, lawful challenges to tyrants’ abuse of power in total, reckless disregard of our basic human rights and bodily integrity. Even the skinheads, Aryan Brotherhood and American Born whites came to an agreement with Blacks not to be subject to these human radiation experiments. To my knowledge, there were no threats of violence, there were no assaults and there were no mass demonstrations – just individuals refusing to be the government’s test dummy for this Rapiscan x-ray product being illegally used on us in violation of the Code of Federal Regulations. But if we had ganged up on an inmate, no such lockdown would’ve occurred for more than a couple of days to a week. Imagine that! Send our brother some love and light. Write to Eddie Milton Garey Jr., 91876-020, USP Big Sandy, P.O. Box 2068, Inez KY 41224. Previous articleThe Census form: Send it back! First, it is not accurate to analogize the backscatter imaging devices to medical CT scanners (and worse to use CT interchangeably for backscatter through the piece). CT scanners use focused X-rays targeted in repeated shots through your body. The levels of radiation exposure in the most benign CT scan is still substantially more than (is supposed to be) in backscatter imaging. Next, radiation ≠ radioactive. X-rays are radiation (as, incidentally, is sunshine), they are not radioactive. Radioactivity connotes energy emitted from the decay of a radioisotope. High-energy X-rays, may be radiation, but they’re not radioactive. Backscatter imaging does use ionizing radiation, and I think it’s appropriate that it should be subject to FDA regulation. If there are quality control failures of the radiation controls of these products, there should be very serious consequences for the manufacturers. And if a device is subject to government regulation and approvals relative to the safety of use, it is appropriate that the device get those approvals before it is used on anyone without their informed consent…visitors to a courthouse, air passengers, and prisoners. Those who go into the prison business to make money are even more likely to have little or no scruples about what is done to increase the extent to which the imprisoned are capitalized upon by fellow human beings. Privateers have more fiscal incentives than government employees to look the other way at violations of right and merciless use of those behind bars for incidious purposes and entering a profession long known for providing opportunity to “power trip” at being deemed an authority figure in charge of a captive population. Wash’t it Kissinger who said “power is the ultimate aphrodisiac”? To my way of thinkiing there is something suspect about anyone who pursues employment in the prison system. Good old boy mentalities created and rule it. Racism is rampant and all types of abuses are epidemic. Those incarcerated are by definition cut off from communication with the outside world and locked within a microcosm of evil incarnate and anyone on site is either associated with those empowered or those unempowered. No ombudman or observer thus is there who might mitigate the potential for abuse that not only exists but has long been cultivated with impunity. This facility has been on lock down for 2 months. The inmates have been unable to speak with family/friends to tell them what the lockdown was about. I must say Im not surprised to see that it is due to the inmates refusal to be used for for monetary gain. There have been years of reported violence in this facility. Never has the lockdown been as long or as secret. Please if you have family or friends there write or call the Bop. Money and power really are the root of all evil. I fact-checked this article to see if I could forward it to my network and concluded that I can’t send it until you correct or explain your assertions on radiation levels, which seem unfounded. Rapiscan is claiming 10 Microrem per exam as compared to 1,000,000 Microrem for a CT scan (see epic.org/privacy/surveillance/spotlight/0605/rapiscan.pdf). Seems I’ve heard this story, or some version of it before, at Walla Walla Sate Prison, near the Hanford Nuclear Complex. I have a loved one at Big Sandy, and he was forced to submit to one of these x-rays for no apparent reason or threatened with being put in segregated housing “The hole”. About week later he wrote to me complaining about feeling dizzy like he was going to pass out. He didn’t even know what the lockdown was about until I told him. They finally are off lockdown but now I hear that they are starting the x-rays again, and still threatening them with “the hole” and losing their jobs. My loved one just got a job with UNICOR and it would be a shame that he would be punished for standing up for his human rights. Especially since the inmates are willing to submit to a full body search. Something needs to be done about this. with a blind school/research institute that is in Ok. If they implemented this in the airports, would they be telling everyone so that the passengers know that they are being "checked out" when they are being scanned?! I feel like this would encourage a lot of sexual problems.